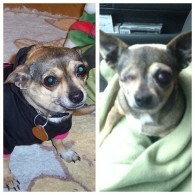 Success Story, Molly - Sponsor Adoptions, Inc.Sponsor Adoptions, Inc.
“This is our sweet Molly before and after her attack on Saturday February 1st. She was viciously and violently strangled by someone to the point that her right eye came out. She had to have it removed. Her vision in her left eye is very doubtful now but thanks to Sponsor Adoptions Molly will have a future. Thank you all so much for helping our beautiful Molly!!! !”Thank you to our supporters who continue to donate so emergencies such as this can be dealt with and animals do not lose their lives over such cruel human beings.